Questa pagina è stata visitata 12395 volte dal 17 Giugno 2004. Una nuova, grandissima rivoluzione sociale (Internet) chiude un'epoca - quella dell'informazione costosa ed "ingombrante", fatta di tomi voluminosi. E si apre l'era dell'e-book, il libro elettronico: un file di testo (in formato standard ASCII) "incorporeo", un flusso di parole senza corpo (nè un libro, nè una riproduzione fotografica), che può viaggiare da un capo all'altro del mondo attraverso i computers. Puoi leggere tutti i classici della letteratura, e GRATIS! Per trovare il libro che cerchi, basta digitarne il titolo (o l'autore, o altre informazioni a tua disposizione) - senza dover fare il giro delle librerie o delle biblioteche. Il primo traguardo è rendere disponibili in formato elettronico i libri più usàti. Il rapido sviluppo di programmi di traduzione vieppiù sofisticati renderà qualsiasi e-book disponibile non solo in inglese, ma in qualsiasi lingua. Gli attuali "lettori" (computers portatili specializzati nella visualizzazione di testi) verranno presto soppiantati dall'e-paper ("carta" elettronica: un monitor dello spessore di una pergamena), dalla maggior risoluzione e assai più comoda da leggere. Il numero di e-books disponibili è naturalmente destinato ad aumentare "esponenzialmente" nel tempo, cosicchè dai 10.000 titoli disponibili nel 2001 si passerà a MILIONI di e-books - fino al raggiungimento dell'intero scibile umano. Traguardo mai prima d'ora eguagliato nel corso della Storia, neppure dalla mitica Biblioteca d'Alessandria d'Egitto. contribuire al Progetto Gutenberg, aiutandoli nel lavoro di ricopiatura. 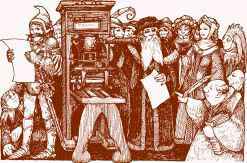 The purpose of Project Gutenberg is to encourage the creation and distribution of English language electronic texts. We prefer the texts to be made available in pure ASCII formats so they would be most easily converted to use in various hardware and software. A file of this nature will also be made available in various markup formats as it is used in various environments. However we accept files in ANY format, and will do our best to provide them in all. We assist in the selection of hardware and software as well as in their installation and use. We also assist in scanning, spelling checkers, proofreading, etc. Our goal is to provide a collection of 10,000 of the most used books by the year 2001, and to reduce, and we do mean reduce, the effective costs to the user to a price of approximately one cent per book, plus the cost of media and of shipping and handling. Thus we hope the entire cost of libraries of this nature will be about $100 plus the price of the disks and CDROMS and mailing. Currently the price of making CDROMS is said to be about $500 for mastering and then $2 per copy. To create such a library would take less than one out of ten of a conservatively estimated 100,000 libraries in the U.S. alone: if each created one full text. If all the libraries co-operated, it would be less than 10% of a volume per library. If there were 10 members of each library creating electronic texts, then each only has to do 1% of a single book to create a truly public library of 10,000 books which would each be usable on any of the 100 million computers we are targeting. So far most electronic text work has been carried out by private, semi-private or incorporated individuals, with several library or college collections being created, but being made mostly from the works entered by individuals on their own time and expense. This labor has largely been either a labor of love, or a labor made by those who see future libraries as computer searchable collections which can be transmitted via disks, phone lines or other media at a fraction of the cost in money, time and paper as in present day paper media. These electronic books will not have to be rebound, reprinted, reshelved, etc. They will not have to be reserved and restricted to use by one patron at a time. All materials will be available to all patrons from all locations at all times. The use of this type of library will benefit even more greatly in the presence of librarians, as the amount of information shall be so much greater than that available in present day libraries that the patron will benefit even more greatly than today from assists in their pursuit of knowledge. Therefore, we call on all interested parties to get involved with the creation and distribution of electronic texts, whether it's a commitment to typing, scanning, proofreading, collecting, or what ever your pleasure might be. Please do not hesitate to send any e-texts you might find to this address. If you prefer sending disks, a mailing address follows. We hope to be thanking you soon for your participation.